Jewelry Armoires: I did a search on Wal-Mart.com and came up with a long list of jewelry armoires ranging in price from as low as $45. Sam's (yes, I know they are the evil twin of Wal-Mart) is another good place to look for jewelry storage. Jewelry Boxes: Where else will find jewelry boxes but The Jewelry Box Shop. Of course, lots of places carry jewelry boxes including many department and discount stores, but I just thought this is a great example of how you can find everything on the Internet these days. Needless to say, this site has a huge selection of jewelry boxes. They also offer a personalized engraving option. Jewelry Bags & Travel Cases: Look for Plush Creations to create some luxurious jewelry bags for the gal on the go: " Our jewelry bags include three separate and distinct size zippered compartments using invisible zippers. They are approximately 10 x 7. There is a necklace hanger so that necklaces may lay in the deep pocket, thereby preventing tangles. 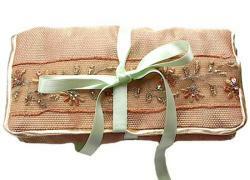 Rolled or folded over, ribbon tied, they are designed to fit nicely into a carryon or handbag." These range in price start at around $40. Pictured is their Dreamweaver Jewelry Bag, $45. A monographing service is also available. If anyone is looking for a jewelry box that’s not mass-produced, my husband just got me the most beautiful jewelry box I’ve ever seen for Christmas. It’s hand made by an artist in Colorado, and is absolutely stunning. The box included a card, his website is http://www.stevesmithboxes.com. I know they are are more expensive than what you can find at Sam’s or Wal-Mart, but this is hand made and is so pretty that it’s like a piece of art in my room. Best gift I ever got!